Located at the corner of Post and Grant Street in the heart of Union Square shopping district. We are two blocks away San Francisco's ChinaTown, the largest Chinatown outside of Asia, with many great cultural experiences and tourist attractions! Easiest way to get to our store: Bus, Train, bike, or walk here easily- steps away from the Montgomery Bart Station and plenty of nearby parking garages. WOMEN'S - Special collection store catering specifically to women. APPAREL - Jackets, gloves, insulated outerwear and activewear that will keep you going as temperatures drop. YOUTH - Warm, comfortable apparel, footwear, and accessories engineered to keep young adventurers ready for whatever comes their way. EQUIPMENT - Prepare yourself for any cold weather expedition you come upon this season with durable, time-tested equipment. FOOTWEAR - Lace up for treks across tundra-like terrain with men’s, women’s, and kid’s winter boots and shoes. SUMMIT SERIES - The World's finest Alpine equipment. ACCESS PACK - Try our most innovative backpack yet to keep all your essential gear and devices at your fingertips on morning commutes and urban adventures. 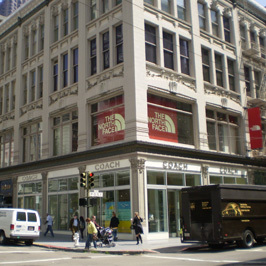 Shop at The North Face San Francisco for HIKING, WINTER RUNNING AND TRAINING, and SKIING AND SNOWBOARDING gear, plus high-tech apparel for all outdoor activities. Don’t let the elements keep you from experiencing new and exciting adventures, or comfortably getting where you need to be. Find great winter essentials on OUR BEST WINTER JACKETS, PARKAS, SNOW BOOTS, PACKS and more. Visit The North Face online or in-store to find performance apparel from our latest collections and winter essentials for the whole family.